Transform your cakes into elegant culinary creations with this Satin Ice 10003 white vanilla rolled fondant icing! This fondant is perfect for covering wedding cakes, birthday cakes, and custom novelty cakes with a satin-smooth finish. It enhances any dessert with a bright white color and a sweet vanilla flavor that does not overpower the taste of the cakes, cookies, and pastries themselves. Extremely versatile, its dough-like consistency can be molded, twisted, shaped, and sculpted into decorative flowers, bows, and character figures. His is the best fondant for price and quality. I’ve been using it for 10 years and I put it on all of my cakes. It is very easy to work with and it tastes great. Love this fondant. It is always fresh and tastes great and is easy to color for decorating detailed cakes. I have used it for over two years now and never had any issues with it. I’ve tried many different brands and even my own marshmallow fondants and this is absolutely the only product I’ll use to cover my cakes with! It does elephant skin and it so easy to work with! Absolutely loooooveeee this brand of fondant! I originally bought the 5 pound tub, but soon realized that I needed a lot more for my baking business! All of my customers absolutely adore the taste of this fondant, especially compared to how other fondant out there taste. Great buy! For someone that is new to working with fondant stain ice has been great. It doesn't set super fast so it gives me more time to work with it since I'm still learning. We love this fondant! It does dry out and elephant-skin quite easily, but it tastes great, covers well, and is vegan, which is perfect for our cruelty-free bake shoppe. This is the most used fondant out there. It's pretty thick stuff, which is good. It doesn't dry TOO quickly but will eventually dry to a solid shape if you give it a few hours to harden. Have used it for detailed fondant work, banners, stand up shapes and messages and it works for all of it. Very dense and not the absolute cheapest fondant out there but very reliable and worth the price. We'll keep buying it long into the future. Satin ice .... white vanilla fondant..is really good for cover cakes..and cupcakes..I use many times in my fondant cakes and work perfectly..even with cupcakes or figurines..
First time buying this product. It was so easy to work with and rolls super smooth! This will be my number one choice from now on. I love it! Love love love this fontant. It is my go to! Easy to work with with reliable results everytime! I recommend not only the white but all of the colors. Seems to last forever, it's not to much of a difference, and it's a big bucket. Easy to roll and easy to mix dye and gumpaste. I just love this satin ice fondant!! Tastes delicious and very easy to work with. I use it to cover my cakes and also make accents!! This fondant is great I prefer it over Wilton’s fondant it is a pure White color and colors beautifully! It taste great and I’m not a fondant lover. It has a nice smell to it and also rolls out really thin so your product will last you a good amount of time. I love the satin ice 20 lb white vailla rolled fondant icing. It actually tastes great and it so super easy to work with. I 100% love it. Very pleased and impressed with the white vanilla rolled fondant icing from Satin Ice. The white fondant is excellent for creating all kinds of decorations for our pastries and cakes and is easy to handle. I love this fondant. You can use Wilton color gel and customize what every color you are looking to achieve. This is a great investment cost wise and also quality. my go to fondant! covers great and very forgiving,it also taste so great,seams are no more and seem to dissapear and the whitest white too. LOVE LOVE LOVE!! I read a few reviews saying it was hard to work with and they added water. I found that if I rolled out the fondant very thin it dried out faster than what I am used to. I just squished it back together, added some crisco and rerolled it out. Thicker pieces I did not have a hard time with. I will be using this product from now on! Great price and quality. The best I have found from any place yet. I keep the buckets after I go through the fondant to store my bulk ingredients. My favorite brand of fondant. The taste is delicious and it is great to work with. After using this brand I will never go back to others. in the beginning I LOVED this fondant since it dried so nicely but after a while I was getting complaints that the fondant was cracking off the cookie. I came to the conclusion after throwing 2 tubs of it away that its probably perfect for cakes but not as good for cookies. 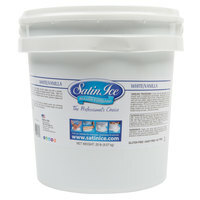 The large container of satin ice fondant is a great deal, fondant is expensive and can be finicky to make on your own. This rolls out nicely. Only complaint would be that it is a bit difficult to actually get out of the container. This white vanilla fondant icing is great. It is smooth and easy to handle, and is so much more convenient than trying to make your own! We love satin ice fondant. It tastes great and is easy to work with. It is perfect for sculpting pieces for cakes because it will dry hard. Easy to color. One of the best fondant brands available in the market. Didn’t stretch, tear or develop elephant skin while working with it. Strong yet soft and tastes great. I love working with Satin Ice Fondant. I have used other brands, some a lot more expensive, but Satin Ice seems to be the one product I fall back on. It's convenient to buy, comes in a ton of colors, flavors, and sizes, and works really well for covering my cakes. There's a reason it's loved by cake decorators! Great brand of fondant. It's easy to work with and cover. I never got bubbles or lumps of dry peaces in it. It also works so much better with tylose then other bands. This satin ice white vanilla fondant is perfect for all of our fondant needs in my High School culinary class. I teach my students to make fondant, but sometimes we just need to have some ready to go and this is perfect for our needs. It is easy to work with and easy to color. Satin Ice Rolled Fondant is very easy to use and tastes better than most on the market. I don't make to many fondant cakes but love having Satin Ice around for when I need it. The Satin Ice fondant not only works well, but tastes good too! It doesn't get the air bubbles that some fondant does after working it for a while and it doesn't dry us as fast as other fondants do. Will definitely be my go to!! I have a hard time rolling this fondant. I usually use Wilton fondant and am able to add powder sugar easily without it drying out. This Satin Ice doesn't take powder sugar well. It is a lot of fondant for the price, I just have to figure out the best way to work with it. I buy all my satin ice fondant from webstaurant. It’s the best value and Satin Ice fondant is so easy to work with and it has a great taste too! Satin Ice isn't our favorite brand of fondant for cake covering, but we always have it on hand in the bakery to cover boards, use in decorative items, etc. This is priced right and great to buy in bulk. This is my favorite fondant to use. Nice consistent quality. Super easy to work with and tastes good. I've used several types including homemade and this is easy to work with with a nice clean finish. I have been using this fondant for 7 years. Great quality. Knead nicely. Easy to use. Never had a complaint about taste. Much better quality than Wilton. The white vanilla rolled fondant icing is great and perfect for making our cutout specialty cookies. Love the great size of the pail and a perfect item for our bagel and bakery shop. This is the best fondant I have found. I personally do not like the taste of any fondant but I love working with it and I love the end results. By far this is our favorite fondant! Love that we can order on Webstaurant because it's cheaper and is delivered very quick! We would recommend this to all cake decorators! An awesome vanilla fondant that I can always count on to be perfect and crack free. Love the ease of working with this fondant and so pretty. First off this fondant is a really great value! It last such a long time and save a lot of money in the long run. Just i tip, use vegetable shortening when working with it. I was using confectioner sugar and it made it really dry. A great quality white vanilla fondant icing that is great for decorating cakes. The fondant rolls out easily and is great to work with. No tearing or cracking. I brought the big 20lb bucket because I used it a lot. It’s a very good price and works great. I will definitely buy again. This is my go to fondant I have used it for years. It does not dry out like other brands and comes in a airtight bucket . this is a really great product it is really easy to use and adds a great smooth finished look to all my cakes I'm very pleased with this fondant. I have worked in fondant for over a dozen years, Satin Ice is by far my favorite brand. I source nearly all of my baking supplies out of NYC avoid scaled costs from local merchants but the weight of a 20b tub always causes high shipping anywhere Ive shopped online.....until I found that Webstaurant Store gives a far price AND a fair shipping cost. Thank you Webstaurant Store!! Hi, the while vanilla rolled fondant icing we ordered from you works very well in our bakery. We use it almost every day on special cakes. We decorate a lot of cakes and I just love the Satin Ice Fondant. It is easy to work with and lasts for quite a while. A wonderful fondant that is a great price. The fondant is smooth and rolls out easy for quick and easy handling. The white is perfect for wedding cakes. Satin Ice Fondant is actually pretty good. I've tried many fondants out there, but none of them can beat Satin Ice in flavor, texture, temperature holding, and more. Will never change for another. Amazing fondant so easy to work with and taste great. I run through these buckets but this is the best price available so it's Amazing! 5 stars! Satin Ice 10003 20 lb. White Vanilla Rolled Fondant Icing is the cheapest & best item so far! Ive compared the price to different websites and you cant get any cheaper than this. Ive used this fondant to cover my cakes and cupcakes and i am totally happy with my purchase. Will definitely buy more! I LOVE the satin ice fondant. Its so much better then Wilton brand with regards to taste and workability. I use fondant a lot and the Satin Ice is the gold standard! Ordered last minute, fondant arrived within 2 days, secured, fresh and price is affordable in comparison to other online sites, thank you so much your new customer! I have always made my own fondant but i wanted to give this one a shot since i heard so many good things! ... and it was the best decision, ever! Its nice and smooth, really easy to work with and also saves me alot of time especially if i just need it for something small! I love working with Satin Ice and have been for years. Webstaurant Store.com offers the best price, timely delivery and the product is fresh! Love it! This is my first 1 star review, but I am so disappointed with this product. It ruined 2 of my orders this weekend. The fondant is extremely difficult to work with. It is very soft/sticky at first and then dries out extremely fast making it brittle and hard to work with but even after drying it doesn't firm up enough to hold a shape for making any type of decoration. So what happens is almost an outter crust type effect where the surface is dry to nearly hard but underneath still a soft sticky mess and when I picked up the fondant to place on a cake it would crack all over. I tried several different approaches to work with it none of which gave a good result. Please offer another brand of fondant cause I'll never waste money on this product again. We appreciate your review, Ashley! If you ever have questions about the product you purchased, please contact our Customer Solutions team. I love this white fondant. It rolls out nice and really works well for any fondant work that I do on all my cakes. If you do not cover it up it will dry out; however you can add shortening to it and it will bring it back to its original texture. Very good product. Works well with humidity and I would say the best fondant if you're a beginner cake decorator. Just the right balance of smoothness (not sticky and not dry). Most people do not eat fondant because they are too sweet but when I started using Satin Ice my customers actually complimented me of how good the fondant taste - not too sweet like the ones they have tried before. Great product! 100% recommended. My favorite fondant to work with by far. Taste great, easy to work with & makes my cakes look amazing. I love how I can buy large amounts and if I need to can dye them to the perfect shades of my choice! Great fondant! I was thrilled that webstaurant carried fondant! What an amazing deal! Now I know where to get fondant. Product was amazing! Great deal! I love the value and consistency of this product! Great quality for the price, colors well with a smooth texture and pleasant smell, and much better flavor than some others. Perfect for decorations, they dry quickly and hold their shape, but can be tricky to cover cakes flawlessly. Overall very pleased and will continue to purchase. Happy with this product. Doesn't dry while you are working with it, stays fresh a long time so I buy it in large quantities always. First time buying fondant from Webstaurant store and will order from them again. The price is cheaper than other websites for the quality item. I highly recommend getting it from Webstaurant store. I love Satain Ice Fondant. Glad I found a place to get it at a economical price. I will Be ordering again. Also it is very pliable. What a GREAT deal for so much fondant!! I used it for a Broadway themed cake and it worked so well!! No cracking! Couldn't be happier!!! Satin Ice is a great fondant, and the best that I have ever tasted. This bulk bucket of fondant at a great price saves me from having to make multiple trips to the store. I love the convenience of having so much on hand at once. The absolute best Fondant to work with. The pricing here is excellent and shipping is pretty quick. I'm a very satisfied customer. Thank you for outstanding service. This is an amazing deal on this Satin Ice fondant! It ends up being about 30% of local cost, even after adding shipping to the cost. Will always love and use satin ice. Smooth finish on your cakes and not to mention how easy it is to work with it, as long as you work fast you won't get elephant skin. I love satin ice fondant. It's the only brand I use for my cakes. It colors well and is very smooth. And this is the best price I have seen on the 20lb bucket anywhere. My favourite fondant to use in my bakery. It can have a few variations in the texture, but thats easy enough to remedy and it lasts a long time and tastes pretty good! This is a great product. It is very easy to roll out and colors easily with gel colors. The price is unbeatable and ships very quickly. I will buy again! Thanks. We love using the satin ice fondant, it rolls out beautifully and holds up so nicely with molds, ruffles, etc. we love the pure white look if gives too. We absolutely love our satin ice fondant. The taste is amazing and the customers love the nice finished look that it gives to the cake. This is an AMAZING DEALLLL!!! there is so much fondant here. Satin Ice is my go to brand and this is by far the best price I've ever come across. Satin Ice is my go to fondant icing. It's makes life soo much more easier when decorating a cake. It comes in all sorts of colors and the taste so great. I find that it's a lot more flavorful than homemade and does not even taste like a store bought product. This fondant tastes awesome and is very easy to work with. Excellent price for this amount of fondant. I Will be ordering this product again for sure! Absolutely the best stuff out there! I only have great things to say, very easy to work with and it handles very well. i use Satin Ice on all my cakes....looks great, tastes great and is simply the best. My favorite kind of fondant is the Satin Ice brand. It is easy to work with and tastes great. Very glad webstaurant offers it at a great price! I love this fondant. Ive orded it about 5 times already and I'll continue using this fondant for my decorated cakes. I've made several colors and never had a problem. Satin Ice fondant is one of the few fondants my clients like. I've never had a real issue with it, except it cannot spread too thin on a cake, but thin enough where my cake details show. The pricing is great for me. No complaints! This fondant is all my cake shop uses. It can be used to cover cakes, make characters, bows, cover boards, everything!! I prefer Satin Ice fondant over Wilton fondant because Wilton fondant is too soft and takes days to harden. Not at all an issue with satin ice. Satin Ice is my top choice!! Satin ice fondant is my go to fondant. It is pliable and allows you enough time to cover a cake without drying out and leaving you with the dreaded elephant skin yet isn't as sticky as some other fondants as I've tried. Great product with great value. I love satin ice. I use it on all of my cakes. Webstaurantstore.com shipped it super fast. I will be placing another order very soon. I love this product. The stain ice fondant tastes great as well as looks great! Its very easy to work with. This is the only brand I use and the price from this website I'd unbeatable. The colored fondant is very vibrant! Even in Suriname, South America we use this beautiful product. It's very smooth and great to work with. Will be buying more in the future.